In a campaign, we will import customer information first from a csv or excel file, then we can assign the customers to agents, agent login and dial the customer one by one, they can select the call result, make a scheduler for next call or mark the customer as failed/success. During the call, if customer is interested, agent could send email/SMS/fax in agent portal page. You can install asterCC on a server, PC or Virtual Machine. We need a trunk for outbound calls at first place. Network trunk– asterCC supports trunks with SIP and IAX2 protocol. We do not need extra facilities when using such trunk. Different ITSP has different connection way. For instance, most would offer user name, password and server address for connection. E1 – we need a E1 voice card and audio gateway (AG) with SIP protocol for transferring E1 calls into SIP calls. Analog trunk– we do not recommend analog trunks for outbound system, since most analog trunks do not have reverse polarity signals, thus, the system cannot recognise user status, which means, when the calls are not answered or the numbers do not exist, the system would think there is a answer signal and transfer the call to IVR. Therefore, we do not recommend an analog trunk in this condition. To build an analog trunk, we need an analog voice card (FXO interface) or an audio gateway (AG) of the analog trunk. We need at least an account to bill the compaign, and extensions to test the trunk. We also need to take into account the agents which may be used someday. Considering the system offers 5 agents' license, we now build 5 accounts, and each account has an extension and an agent. Please refer to: Adding Trunk, configuring_a_trunks, and build a trunk for compaign. try to call, and if there are problems, continue the checks on the trunk. To achieve better service, we need to build a agent group to answer the customers who need operator services. In the menu on the left, choose User→Agent Groups,and Add agent group. 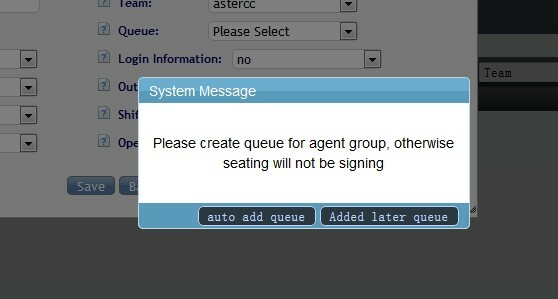 Portal: When agents login the agent interface, the system will open a page by default. Here we choose default. Click [Add Agent], and select the agents into the group, then save. Here we assign agent number 5000 the monitor of the group. Each group needs a queue, and if the system cannot find there is no queue when you save, there will popup a tip asking if a queue is to be created, and now we choose “auto add queue”. In the menu on the left, Advanced→Queue: In the Queue management page we can see the automatically added queue. Double-click to modify. Customer Package: the target of the campaign, if you dont select one when you add a campaign, system will create an empty one for you. a customer package will store the customer information which is waiting for dialing in the campaign. We could add one or several email templates for the campaign, so agent could select one template to send to customers during the call. We could config a call code to sort the numbers we called. the code could be configured for global or just for a team. it could be also assign to one or several campaign. we could define the result for “Answer” or “No Answer”, system will switch based the call automatically.